If you pay much attention to water sports, you might have noticed that surfing seems to be making something of a pop culture comeback. That’s not to suggest that it ever went anywhere. Surfing has been very popular for a very long time, and there’s never really been a break or interruption in that popularity. But the sport’s place in mainstream consciousness can ebb and flow over time, and in the last two years we’ve seen a minor but noticeable return to prominence. This all started in 2015 with the remake of Point Break, one of the more iconic action sports movies of all time. The remake earned terrible reviews and failed to live up to the cult classic quality of the original, but it was still an action movie that revolved around surfing culture. In much the same way that Friday Night Lights promoted football culture or The Fast & The Furious advertises street racing, Point Break is a celebration of action sports, and surfing in particular. And it’s more than just the silver screen where we’re seeing surfing make a comeback. Fans of online gaming have also seen more nods to surfing culture courtesy of an “Everyone’s Going Surfing” promotion running at a prominent casino site. The event promised an online game that helped everyone to enjoy the feel of the ocean in spirit, it was essentially a surf-themed promotion. It doesn’t quite boast the widespread appeal of some other promotions typical of these games, often revolving around popular TV shows or movies, but it does demonstrate that surfing still draws a crowd. More recently, we’ve even seen surfing making news headlines for reasons that have very little to do with sport. Back in March there was an article written about how surfers might save us from climate change, if world governments fail to do so. Describing surfers as a “giant tribe” that stretches worldwide, it suggested that few groups of people are more in tune with changes in the climate, or better positioned to spread awareness. From film to gaming to political news, this is a big spread of surfing material from the past few years, and it all serves to illustrate that the sport is just as popular as ever. If that happens to give you the itch to get back on the board, or even try surfing for the first time, we wanted to highlight some of the best spots in the Pacific to ride the waves. 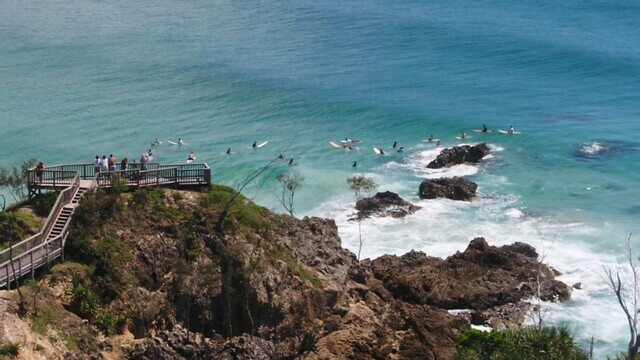 Byron Bay is known as one of Australia’s best surf spots for two reasons: variety and excellence. There’s good surfing throughout the bay, which means you have your pick of beautiful spots where you can probably get in some good rides. One notable stretch is The Pass at Clarkes Beach, which has a particularly strong reputation for its waves. Honolua Bay – Hawaii, U.S. There are almost too many great spots in Hawaii to choose from, but it helps that some of them are too challenging for most anyone but the professionals. Honolua Bay’s breaks are no picnic, but if you know what you’re doing they make for a brilliant experience. This is one destination that will make you feel good about your abilities if you can handle it. If you imagined a surf spot in heaven, this is probably something like what you’d come up with. Tavarua feels like an ideal relaxation and watersports spot plopped down in the middle of the Pacific just for you. It’s a tiny island surrounded by shallow water, beyond which there are plenty of waves to play on. It’s also become a hot spot for kitesurfing, but surfers can enjoy it like few other places in the world. This is another destination that almost seems to have been built specifically as a surfing utopia. The Cloud 9 surf break is the main draw, and is often packed with talented surfers from the Philippines and around the world. There’s also awesome surfing elsewhere around the island. While Siargao attracts its share of experts, it’s also a great place to relax for a few days (or weeks) while you take lessons. Then there’s Bondi Beach, which may be the most famous spot on this list, but not just for surfing. This is a place to consider if you’re concerned with accessibility and a full vacation beyond your time among the waves. It’s the go-to beach for visitors to Sydney, meaning it’s convenient and world class at the same time. There are plenty more destinations that could be mentioned here, but these five make for a good start. If you’ve noticed the recent uptick in surfing coverage and you’ve felt the urge to give it a shot, these beaches should be high on your list. How to Spend a Weekend in Nashville?